Coast of Araska: Evie being awake! Well, she looks a bit cross-eyed a lot of the time, but it's partly because she's often trying to look at the fish on her playmat. Evie's logging more "awake time" every day. Alas, this is a little sad for us grownups because it tends to fall during Bryan's nap. No more adult naptime I guess! Turn your head for this one... I'll figure out next time how to rotate it for you, but I have Evie in the sling at the moment and I'm having trouble typing as it is! I sort of staged this shot with her and her toy Tikki, by helping her get a finger into one of the taggie loops. 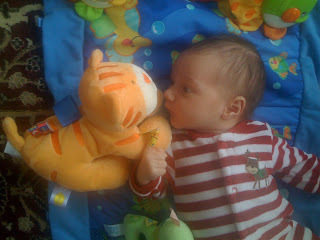 She looks rather intent, perhaps wondering why this little tiger follows her around everywhere!